As some of you may have noticed, we’ve been teasing a few things for Space Engineers lately. 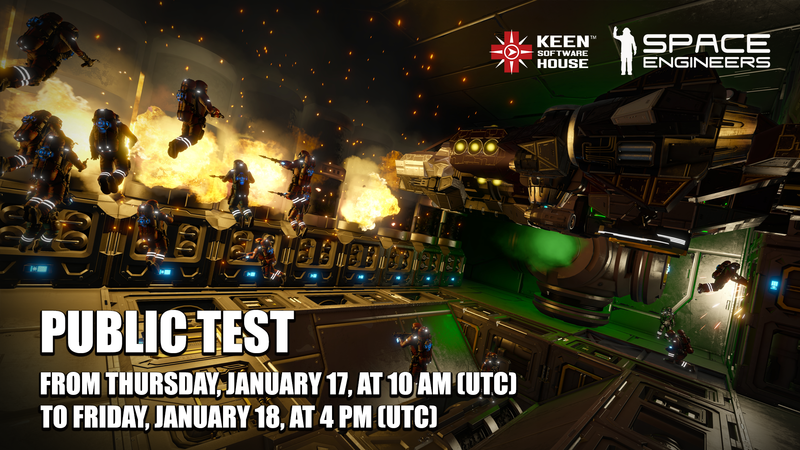 And we’re excited to announce that there will be a public test on Thursday, January 17th, beginning at 10 am UTC and running until Friday, January 18th, 4 pm UTC! We encourage everyone to try out all of the new features. Players will be able to submit their feedback on all of these features via a survey at the end of the test. We will announce the branch code/password at the time of the test. There will be at least two servers: one for the EU, one for the US, and perhaps additional servers as well. If you’re not able to participate in this test, don’t worry! We’re planning to have more very soon. Thanks for reading and see you all online this Thursday!